Louis Robbe: Painter of landscapes and animals; engraver. Louis Robbe was a pupil at the Courtrai Academy and of Jean-Baptiste De Jonghe. He was a lawyer by profession. He moved to Brussels in 1840. He exhibited frequently and with great success. 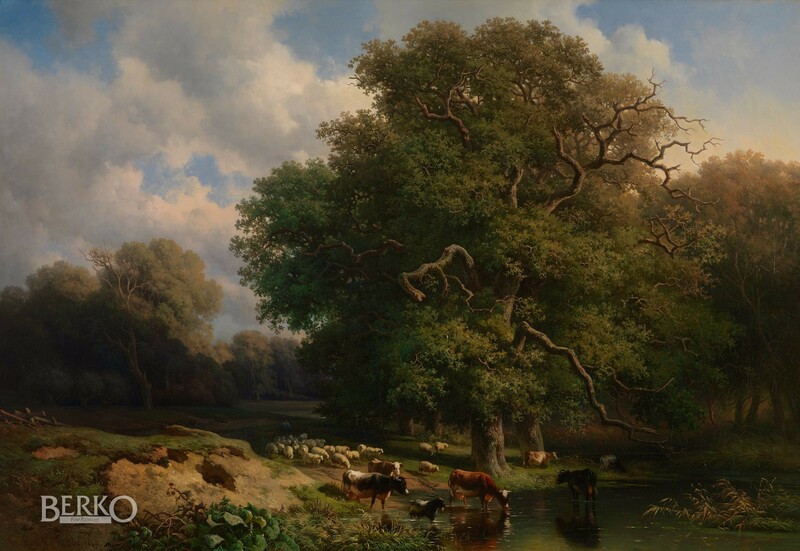 Sometimes his work reflects the influence of Paulus Potter and Eugène Verboeckhoven. Robbe had a great influence on other animal painters. Willem Roelofs: Painter of landscapes; watercolourist and etcher. Willem Roelofs was a pupil of Hendrik van de Sande-Bakhuyzen and studied at the Academy of The Hague in 1839 -1840. He became a member of the Amsterdam Academy in 1852. He lived in Brussels from 1848. He perfected his skills by studying the techniques of the Barbizon School. From 1887 he worked in The Hague. Between 1838 and 1897 he exhibited in Amsterdam, Antwerp, The Hague and Leeuwarden. Robbe: P. & V. Berko, "Dictionary of Animal Painters; Belgian and Dutch Artists born between 1750 and 1880", Knokke 1998, pp. 401-405. Roelofs: P. & V. Berko, "Dictionary of Belgian painters born between 1750 & 1875", Knokke 1981, p. 560.